Most evident is the new outline of this shorter and more compact shape which improves the direct feel because of the reduced swing weight of the smaller nose. The outline is more parallel in the mid-section creating additional surface area for better planing and more stability. The tail width only got marginally wider to maintain the excellent control on fast runs over troubled water. The “shorty” is more agile, quicker to respond and it also carves better in small waves without getting stuck. The bottom features a newly developed Vee flow combined with concaves. The double concave Vee in the nose takes care of the comfort. It then transforms into a flat Vee under the straps which makes the board ride high and fly smoothly over chop. The Vee steadily increases towards the tail which creates more rocker in the rails. When carving the rocker of the curvy rail line delivers outstanding maneuverability. Due to the grip provided, you can carve as radical as you dare. They might look somewhat radical and very different but they are simply the best Freestyle Waves we have ever made. 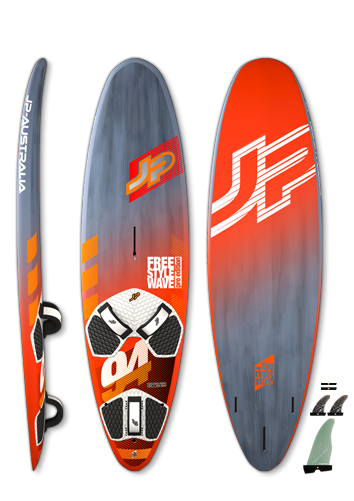 They haven’t lost anything you used to find in the former Freestyle Wave boards but they offer so much more fun and performance without being difficult to ride. From flatwater blasting, to freestyling and waveriding – they cover it all.